Curried crabs recipe is very similar to chicken curry where there is curry powder and coconut milk. Actually curry powder is a combination of several spices. It is a mixture of turmeric, coriander, cummin, chili, fennel and fenugreek. Other spices that are sometimes included are ginger, mustard, cloves, cardamon, allspice, mace, mustard and pepper. 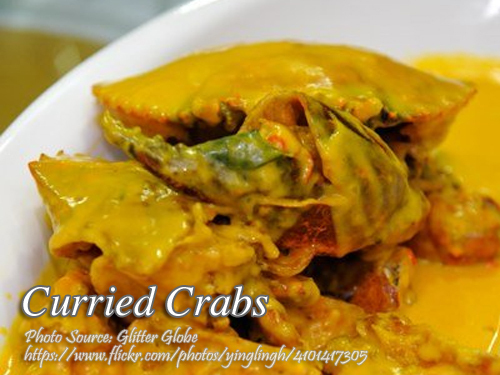 To cook curried crabs; Clean crabs well, remove claws and cut in quarters. In a large pan saute garlic, onions, ginger and curry powder. Add siling labuyo and coconut milk. Bring to a boil and add crabs. Lower heat and simmer for about 20 minutes till crabs are cooked. To see the complete recipe with list of ingredients in exact measurements, continue reading. Clean crabs well, remove claws and cut in quarters. In a large pan saute garlic, onions, ginger and curry powder. Add siling labuyo and coconut milk. Bring to a boil and add crabs. Lower heat and simmer for about 20 minutes till crabs are cooked.